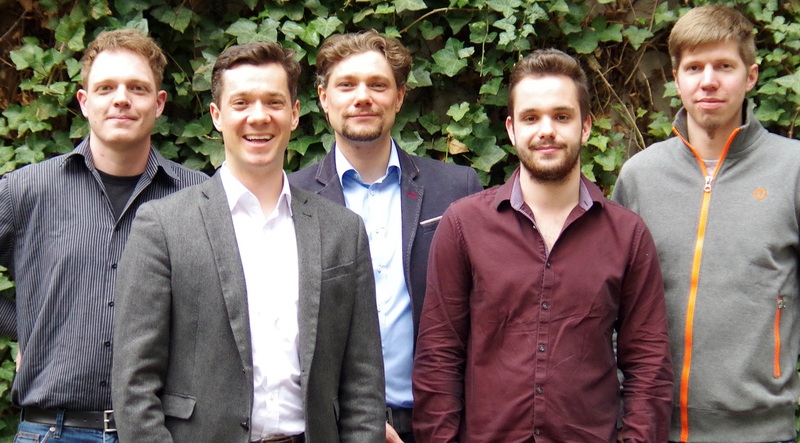 Technology with big potential, working for yourself, well-targeted funding – there are many good reasons to start a company, and they also apply to the Munich startup tacterion. We visited Daniel Strohmayr, one of the founders, at Munich RE. This is where the young company was able to set up camp for several months thanks to their participation in the LMU Entrepreneurship Center Lab. The spin-off from the German Aerospace Center (Deutsches Zentrum für Luft- und Raumfahrt, DLR) plans to bring a unique, flexible tactile sensor technology to the market that gives objects a sense of touch much like humans. “SensorSkin” technology makes products more intelligent and creates brand-new possibilities for human-machine interaction. The technology is built on a polymer-based film, similar to skin, that can be flexibly attached to objects. The film is able to recognize and communicate the amount of pressure placed on particular areas on the material. 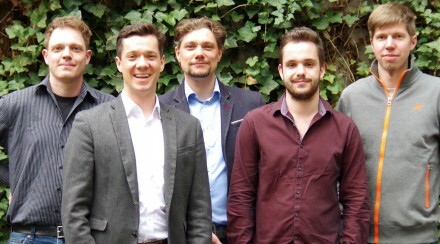 Founded in October 2015, the company was initiated by the trio Dr. Michael Strohmayr, CEO and technology developer, his brother Daniel Strohmayr, a self-declared bridge builder in marketing and sales, and Denis Schneider, who is responsible for developing the electronics. Michael, who completed his Ph.D. at the DLR Institute for Robotics and Mechatronics, realized from early on that this area of robotics research needed to be turned into a product! For Daniel, who studied Business Administration at LMU and Technology Management at CDTM, the issue of autonomy was an additional focus when founding the company. For him, it is also a matter of “expanding my own comfort zone and continuously moving forward,” following the example set by other extremely successful CDTM offshoots like Stylight and eGym. Currently, tacterion is still supported by the Helmholtz Association, which funds spin-offs from related research institutions such as the DLR. This has allowed Daniel to now focus exclusively on developing the company. Although funding to the tune of 285,000 euros for technology development goes to the Institute for Robotics and Mechatronics, it in fact supports the founders to allow them to concentrate solely on their startup. 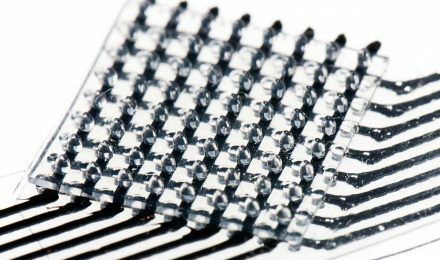 Seven years of research at the DLR were invested in development, and the unique sensor technology is now patented. The startup pays a license fee to use the technology. And the DLR will have a stake in future sales. Before too long, public funding will run out – which means that tacterion will have to stand on its own two feet. Things are looking good: Since their spin-off, the startup has been working rent-free. They were initially supported by the accelerator Techfounders, followed immediately by funding from the LMU EC Lab. Coaching and networking services have also been very valuable, for example from LMU’s Cashwalk and the Munich Summit (MUST). They have had a long development period, and an even longer lead time before gaining their first potential client in the industry. After a pilot project with Festo, an industry partner from control and automation engineering that they met through Techfounders, the founders now have to prove they can deliver large quantities at consistently high levels of quality. “We have a pretty good standing already – we get noticed and approached by tech scouts.” That’s one side of it. “But it can be different when it comes to actually acquiring clients and finding companies who say: Yes, we feel confident that you will be able to deliver 100,000 sensors next year,” added Daniel. That is exactly what the founders are currently working on — the sensors are able to pass specific texts, even under harsh conditions. On behalf of a well-known industrial company (which cannot be named yet – ed. ), the startup has already demonstrated their ability to make that company’s devices sensitive to touch using tacterion sensors. As soon as the contract has been signed, Daniel feels certain that gaining a second client, and then a third, will be much easier. So where are you headed? “We are going to go where the market takes us. We are still planning selectively and deciding what makes sense from a startup perspective. When thinking about production, that means: What else could a certain production line offer clients or segments?” explained Daniel. Currently, tacterion is focusing on three selected branches for B2B and B2B2C, including wearables, virtual reality and handheld equipment. Thanks to the complete flexibility of the sensors, controls could be integrated into clothing without making it stiff, or objects could actually become tangible in a virtual world setting. Their vision: No one will ever have to read instructions again. In the future, a person will only have to touch a device — and the object will already know exactly what the user wants thanks to its sensitive tactile sensors. Technology will adapt to people and not the other way around. What that means in concrete terms: Standard products with integrated SensorSkin should be available in stores by 2018. Some practical features include the ability to increase sensor size as needed and to adapt the production line to meet the various needs of completely different clients. The prospective economies of scale are tremendous. Does tacterion have any tips for other startups? Where the road will take them, where tacterion will be in a few months, whether the startup will have to pay rent, when the first client will sign their contract –– our interest is piqued, and we will be sure to pass along some news.